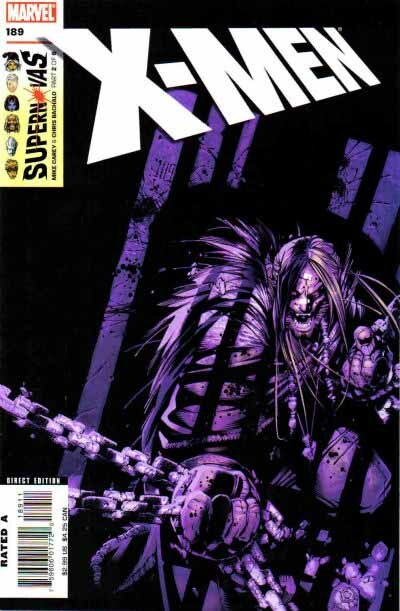 These and all covers and logos ©Marvel Characters, Inc. 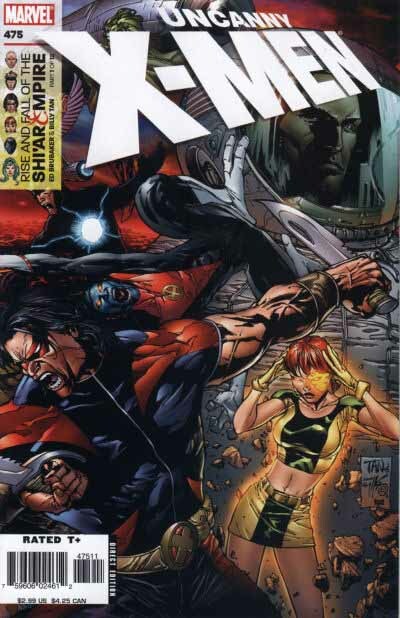 In 2006 the two main X-titles, UNCANNY X-MEN and X-MEN debuted new logo designs by Rian Hughes. Rian is a popular and successful designer from England who works in all kinds of design venues, but obviously loves comics and comics logos. I know this from his work, and from talking to him. The entire trade dress on these covers, including the head-shot boxes and vertical titles on the left are by Rian. The logos are based on the Jim Steranko design from the 1960s, but in a very simple treatment: one color, white, with an airbrushed drop-shadow left and below, most obvious on the upper left corner of the X. While the design of the letters is simple, it does have some interesting features. First, while the letters are about the same height as the Steranko-based version first seen in 1969, the perspective is more extreme. This really allows the X to jump forward at the viewer. Rian has enhanced the effect by widening the ends of each arm of the X contrary to the natural perspective, to make them appear even larger. Try following the edges of the arms and you’ll see they don’t come close to their opposite counterparts. It’s a subtle thing, and works fine. To my eye it doesn’t work as well on this background of mixed darks and lights, but the white outline keeps it readable at least. I like these logos quite a bit, and think Rian did a fine job with them. But they’re only the tip of the iceberg, so to speak. For this assignment Rian created no less than 36 different finished logo designs and submitted them all together to Marvel. No, that wasn’t a typo, I do mean 36! If nothing else, this certainly shows his enthusiasm and determination to give them one they liked! When I do logo designs, I usually begin by submitting three designs or sketches. If none of those meet with approval, I’ll do three more, and so on. My thinking is that if you give the client too many choices, it confuses them. Plus, I’d rather shoot for a bullseye with three shots at a time. If I get past nine completely different designs without hitting something the client likes, I know the assignment is probably doomed to failure for one reason or another. Rian’s approach is one I’ve never encountered with comics logos, and it seems to have worked well for him. Rian sent me all 36 versions, as well as his written proposal. Some are minor variations on a theme, but I picked out 14 I thought were interesting enough to show here. I checked first with Marvel X-book editor Nick Lowe, and he asked me NOT to show six of those 14. Why? Because Marvel might use them in the future. Rian, my hat’s off to you…if they use, and you get paid for all those versions, you’re a very smart and talented man. Okay, with Rian’s permission, here are some excerpts from his written proposal. Right – there seemed to me to be two basic ways to approach this. One – Update the classic Jim Steranko logo. Give it a polish and a modernisation. Two – A break with the past – a brand-new logo. I’ve covered both here in this selection. Personally, I feel it’s always best to go forward to something new, rather than regurgitate the past. This is one problem comics have, not just in looks but other areas – an overbearing nostalgia that prevents them moving on. Think of how different CD design is decade to decade, but how samey comic design is. Having said that, however, I’ve included variations on the classic design too, so you can see how it would look. I’ve also used the strong “X-logo” perspective treatment on some of the new designs. This could be a neat way of having our cake and eating it – a new logo that also tips it’s proverbial hat to X-tradition. I’ve designed a new, more modern way to include the character’s heads on the cover. The band along the top seems to work best, as we can have room for fewer or more heads without cramming them in – the line simply extends further across the page. I recall some of the Claremont-era X-books had a zillion tiny faces in that box! I’ve avoided overdoing the photoshop shading and effects. I always feel a strong logo should speak for itself “naked”, as it were. If we add some of these effects later, it’ll be for a subtle polishing only. Some of the logos without block drop shadows or outlines can sometimes be hard to successfully “lift” out of a complicated or contrasty background. A favourite solution of mine has been used on some: I’ve dropped a subtle shading over the top of the top part of the illustration, enabling the reversed-out logo to read better. This could successfully be applied elsewhere. Colours: Where possible, I think it looks more modern to avoid garish primaries. While Marvel obviously liked many of Rian’s ideas, they did go with a modern version of the Steranko logo rather than some of the completely new ideas he suggested. While I can’t show all of those, here are ones I can. I’d say this super-round design is about as far as you can get from the past, wouldn’t you? Very clever use of the stencilled letter idea, especially the M. The word UNCANNY is awfully small on this one, though. Another stencilled letter idea, this one more like a real stencil. The E looks back to the New X-Men logo by Richard Starkings. I like all the matching diagonals on this one. An interesting design where corners alternate between pointed and very rounded. The X doesn’t read well for me, though. Has some elements of the one before, but a more traditional X, and the Steranko layout and drop shadow. Not bad. I really like the word MEN on this one. A lower case E would be a first for the book, and the letter shapes are attractive. The X doesn’t work for me, unfortunately. Really out there. Rian does some very innovative and original work, and this is certainly one of those. I have a feeling most fans of the book would find it too innovative, though. The word MEN has very attractive symmetry, but it’s hard to read to my eye. Now this one I absolutely love, and if I were making the choice, it would have been on my short list. What a great design — pops off the page, is self-contained in it’s own circle, sells the book title clearly, and is a wonderful contrast to everything in the past. Lots of room for the cover art, too. Or, imagine planning a cover where the circle could be twice this size, that would be cool! An interesting idea that for some reason doesn’t work for me. I think if the letters were leaning to the right I might go for it. This one really says Rian Hughes to me. I like it. Great use of color in the design, and the drop shadow gives it just enough pop to work well. Ultimately perhaps a little too rectangular. If the X were extended on the left side it might add some interest. To sum up, Rian put a ton of work into this design assignment, and I think he deserves high praise for his efforts. I just hope no one expects this sort of logo mass production from me when I’m asked for designs! There, see, I told you we’d have a lot to talk about in this final installment. Hope you’ve enjoyed it as much as I have. This entry was posted in Logo Studies on October 15, 2007 by Todd. Wow! This is quite amazing . . . I absolutely love the first one. Just as much I enjoy watching how the cover art “changes” with different colors and logos. I think I enjoy the ones that break the top bar or intersect with it more than the ones which treat it as a separate entity. Good grief, what a lot of fantastic logos – and these are the ones Marvel isn’t planning to use? I love the ball, and the first one, and the second one . . . Thanks for a great feature, Todd. Thanks so much for this fascinating series, Todd. I really liked seeing Rian’s ideas in this latest post, too. What really hits me — in addition to his cool X-men logos — is the nice, clean trade dress banner across the top. And the other vertical rectangle ideas he’s had using head shots, evoking the old classic Silver Age Marvel trade dress. If there’s one thing that bugs me about Marvel’s covers these days, it’s their dull trade dress (everything other than main logos). It’s just the red Marvel logo box and the creator names, anywhere on the cover it seems. I’d love to see some company-wide trade dress incorporating some of Rian’s ideas here. Thanks, Peter, glad you’ve enjoyed it. That was a very, very interesting and fun series of logo studies. Looking forward to the next title(s) you’ll be discussing! I really like the last 2, especially the Blue one, I think it’d work really well on a book like X-Statix. I’m not too keen on the red ball though, it reminds me too much of the Hoover logo. Rian’s alternate designs above all look extremely “British” to me — if I saw one of them on the rack, I might even mistake them for imported UK comics. I’m not sure what it is about them that makes me feel this way, what design cues I might be picking up on. BTW, this is not a criticism; I’ve been a fan of Rian’s for over twenty years! Just finished the entire X-Men Logo Study. Fascinating stuff. Also, I really enjoyed some of your recent reviews. (FYI, Peter David’s X-Factor has been a really fun read. It might be worth checking out beyond its clever logo.) Looking forward to checking out the rest of your site. Thanks for the kind words and an interesting erudite read, Todd – much appreciated. I now know what I was thinking! Glad you enjoyed it, Rian. I LOVE the idea of the bar across the top. It’s kind of funny actually, after I saw the new trade dress that was used for the books, and how it used the nostalgic little-heads concept in a way that looks modern, I was brainstorming on my own how you could include heads while allowing the logo to be big and centered (I have a thing for trying to get logos centered, because the whole off-center-to-make-room-for-company-name is #1 on my list of things that make books today look too stuck in the past), and came across the same top-bar solution. I laughed when I was browsing his website and discovered what I’d worked out was actually his original intention — why did Marvel not go with this? It’s perfect. Except for the colors. I really really really don’t like all the primary colors in these designs, which make them look like kiddie books. The top bar as I envisioned it would be black with white lettering, the black making the red Marvel logo really jump…and influenced by the top company-bar you see on video game covers today. I just wanted to say I’ve been reading all of your logo study columns and they’re an excellent and fun read. I’ve always been a bit obsessive over logos and cover design myself, so I’ve really enjoyed it. 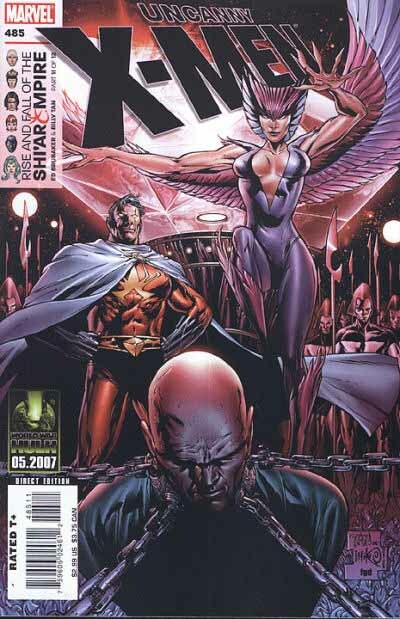 I don’t know if you take requests, but I’d love to sometime have a look at the various general cover layout designs the Big Two have had over the years, and what went into final decisions like leaving just a red “Marvel.com” box as Marvel has of late. I’m also curious if you know when the decision was made to NOT require that cover colors are different from the month before. Have you ever proposed cover format designs for Marvel or DC? My apologies if this came up in one of your columns before and I missed it. And then finally… what do you think of the minimalist designs used by Marvel and DC in current times? Thanks as always for your time and for an informative column… and also, congratulations on creating some of the best logos I’ve seen. Thanks for your comments. I’ll consider your request for the future. I’ve never been asked to create an overall cover format for either Marvel or DC, that’s something their in-house designers do. Years ago I did create formats for some of the annuals that were used across multiple issues. Generally I’m in favor of keeping the “trade dress,” as all the company information is called, to a minimum, so that the art has more room. In past times, brand recognition on newsstands was a factor that made for overly large trade dress. These days most sales are made either in advance or on sight of the cover art, so trade dress doesn’t need to be as prominent.